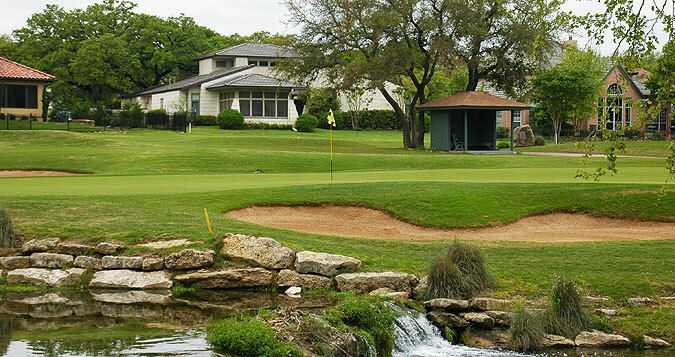 The Hills Country Club, one of Central Texas's premier private clubs and annual host to the FedEx Kinko's Classic was voted as "The most Fan Friendly Tournament Golf Course" by the Champions Tour players and staff. The Signature Course is a totally private course, and hosted the Champions Tour for seven years. Located in Austin, in the heart of the stunning Texas Hill Country, The Hills Country Club combines unequaled challenge with unparalleled beauty. The club offers 36 holes designed by Jack Nicklaus, along with amenities that include a targeted grass range, 3 practice holes, a short game area with bunker and putting greens. Members enjoy one of the southwest's finest and largest tennis facilities and a newly renovated state of the art fitness center. Fine and casual dining plus an array of social activities are available. Golf members of The Hills at Lakeway can also enjoy play on the two 18-hole championship facilities at Lakeway Golf Club - Live Oak and Yaupon, both of which are lauded by the Audubon Society. Award winning junior golf programs and golf development clinics take place year round for Hills of Lakeway members, as do MGA, LGA and a diverse and well-rounded complement of competitive and leisure play. The clubhouse at the Signature Course features a beautifully stocked pro shop, dining area & lounge, plus locker rooms with showers for men and women. Practice facilities are situated across the street, and include a double ended targeted range, 3-hole practice course, short game area with sand bunker, and putting greens. There are 4 sets of tee boxes that play to distances and slopes that measure 7035 yards/141 slope, 6358 yards/133 slope, 5845 yards/126 slope for men and 141 for women, and 5125 yards with a slope of 131 for ladies hitting from the red tees. On course the yardage marking system includes 100, 150 and 200 yard indicators on the fairways and cart paths, plus sprinkler heads that are measured to the center of the green on all par fours and fives. Pin Placement sheets on the golf carts provide info on daily hole locations. There are 45 sand bunkers situated greenside or near the landing zones on the finely manicured tree-lined fairways, and water comes into play in the shape of ponds and creeks on 11 holes. Landscaping is highlighted by pampas and native foliage, plus clear, cascading streams and waterfalls that are built into some of the green complexes. The seventh hole - a 184 yard par three, is simply breathtaking. A wide cascading waterfall fronts the raised green - creating a memorable scene - and a daunting tee shot! The fairways along this rolling terrain are tree lined but usually generous, with some meandering bunkering. Spectacular residences line many of the holes, but are significantly removed from the playing surfaces. There is a mix in size and shape of green complexes, which are generally undulating and sometimes ridged or tiered. As the slope ratings indicate, this course provides an excellent challenge for all levels of players. For more info on the course - and on possible membership and real estate opportunities, visit our page for the course, with direct link to the Hill Country Club website by clicking here.